Samosas are an ancient Middle Eastern dish. Made from dough that is filled with some type of a filling -- typically a spiced potato mixture -- that is then baked or fried, samosas make a delicious lunch or dinner. To make these spiced potato samosas, you will need to make two main components: the dough and the filling. This recipe makes 12 samosas. Prepare the dough in advance if you wish. You can keep it refrigerated for up to three days before making the samosas. In the bowl of a food processor, pulse the flour, salt, and butter for 10 to 20 one-second pulses, until the mixture forms pea-sized chunks. Sprinkle the water over the dough and continue pulsing for one second pulses until the dough forms a ball. Divided the dough into 6 equal balls. Put them on a platter covered with plastic and chill for one hour. Make the filling while the dough is chilling. Fill a large pot with water and bring it to a boil. Add the potato and carrots and simmer, covered, until soft, about 15 minutes. Drain the potatoes and carrots and mash them with a potato masher. In a large sauté pan, heat two tablespoons of oil over medium-high heat until it shimmers. Add the cumin, onion, and ginger and cook, stirring frequently, until the onion is soft, about five minutes. Add the cooked onions to the mashed carrots and potatoes, along with the peas, mint, cilantro, garam masala, and serrano chili. To fill the samosas, you'll roll out the individual dough balls, halve them, roll them into cones, and fill them with your filling. After the dough chills, flour a pastry cloth. Roll the dough balls into six inch rounds and cut each in half. Roll each half-circle into a cone, overlapping the straight edges by about a quarter of an inch. The round end will form the bottom and flat edge will form the top. It should resemble an ice cream cone. Dab water along the seam of the cone and press it to seal it in place. Spoon one tablespoon of the filling into the cones. 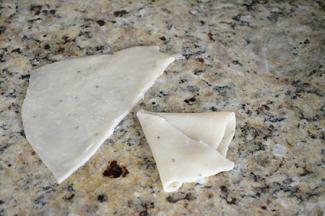 Dab the edges of the cone with water and pinch them together to seal the dough over the filling. Finally, deep fry the samosas until the dough is golden brown. In a large pot, heat two inches of oil until it reaches 350 degrees. Working in batches, fry the samosas until they are golden brown and crisp, eight to ten minutes. While potatoes are the traditional filling, you can also make fillings with spiced ground meats. Replace the mashed potatoes and carrots in the recipe above with 1/2 pound of ground beef, ground lamb, or another ground meat. Mix in the onions and spices listed above and use this to fill the samosas. Replace the potatoes with sweet potatoes, or another starchy tuber such as parsnips, using the onion and spice blend listed above. Replace the potatoes with an equal amount of frozen peas and carrots (unmashed) or thawed frozen spinach, using the spice blend as above. 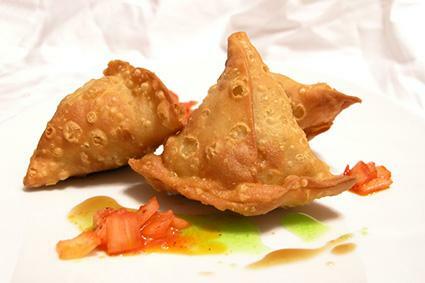 Today, most people think of samosas as part of Indian cuisine, and they do go well with other Indian or Asian dishes. Samosas make a great lunch or dinner entree. Because of their small size, they're also a terrific appetizer or snack. While they are best fresh, you can store samosas in the refrigerator in a tightly sealed container and reheat them, although they won't be as crispy. Serve the samosas with a number of dipping sauces, such as chutney, plum sauce, raita, and hummus. If you've never had a fragrant samosa, you're missing out. Enjoy these delicious filled pastries with their fragrant filling for a meal or snack you won't soon forget.